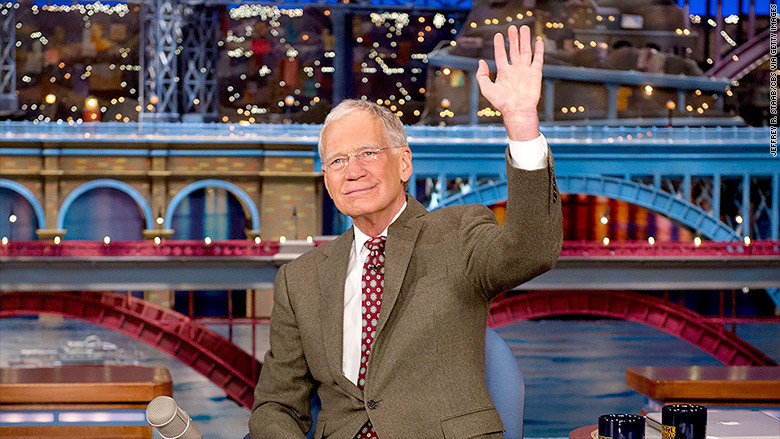 David Letterman is ending his late-night television career with a heartfelt "good night" and goodbye to viewers. "The only thing I have left to do for the last time on a television program... thank you and good night," Letterman said. There were no tears from Letterman, but the sign-off moment was emotional, especially for his longtime staffers and the lucky fans who were inside the Ed Sullivan Theater. Letterman's finale -- which he previously called "the most important show of my life" -- closed out with the Foo Fighters performing one of the host's favorite songs, "Everlong." The show opened with three former presidents and President Obama appearing via videotape, with each saying that "our long national nightmare is over." Letterman then appeared with Obama -- "You're just kidding, right?" he asked the president. Letterman's announcer Alan Kalter, introduced the host as "a boy from a small town in Indiana," drawing laughs from the audience. In his final monologue, the host touched on a sore point in his career saying, "I'll be honest with you, it's looking like I won't be getting 'The Tonight Show.'" At one point, Letterman poked fun at himself by asking how he knew it was time to retire. "One of the signs was -- Todd, the cue card kid, came up to me and said, 'for the love of god, Dave, I can't write the words any bigger,'" Letterman joked. Letterman's wife Regina and son Harry were in the audience. The rest of the late night world also took notice of Letterman's farewell this week -- both Conan O'Brien and Jimmy Kimmel, other late night hosts, told their audiences to tune into Letterman. Fans said the taping had a historic feel to it. David Eisenstein, 70, from Springfield, N.J. said, "I was experiencing something that I will never forget." 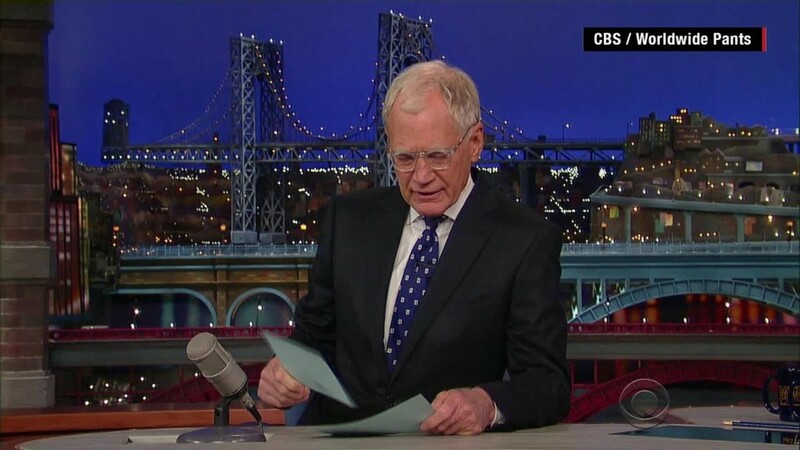 Wednesday's show was #6,028 for Letterman, counting his work on both NBC and CBS. "He changed television forever," Letterman's former head writers Eric and Justin Stangel said in an email. "There will never be anyone like him. We are throwing out our TVs." It was meaningful that the Foo Fighters were there on Wednesday. When the band played on the show last year, Letterman told an emotional story about how the band's song "Miracle" had been added to a video of him and his son, Harry, skiing together. The band was also there the night Letterman returned from heart surgery. 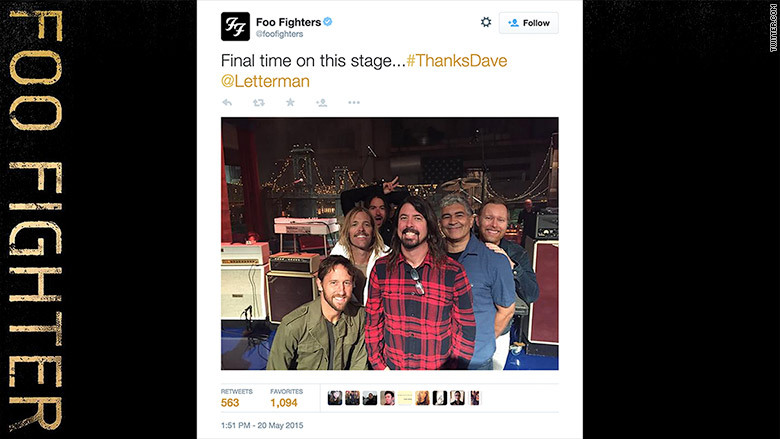 Foo Fighters tweet their last appearance on Letterman's show. The Wednesday night broadcast marked the end of a big and historic week that saw some of Letterman's most beloved guests return to the "Late Show" to say goodbye. On Monday, Tom Hanks took a picture with Letterman using a selfie stick, while Pearl Jam front man Eddie Vedder blasted the Ed Sullivan Theater with the classic song, "Better Man." And Bill Murray, Letterman's first-ever guest, bookended the host's career as Letterman's last sit-down guest by popping out of a cake. This was followed by Bob Dylan serenading Letterman with the smooth standard, "The Night We Called It a Day." Before the taping, CBS Corporation CEO Les Moonves even came on stage to thank the broadcasting legend. "Late Show" host David Letterman waves to his audience at the Ed Sullivan Theater after announcing his retirement last year. After the taping on Wednesday, some of Letterman's staffers were expected to gather for a wrap party. Letterman hasn't said much about what's in store for him, though he and his producers will have to move out of their office soon -- the staff of Stephen Colbert's "Late Show" is about to come in. "I think he's going to do a wonderful job," Letterman said of his successor during the telecast. "I wish Stephen and his staff and crew nothing but the greatest success." --CNN's Henry Hanks and Amanda Hobor contributed reporting.